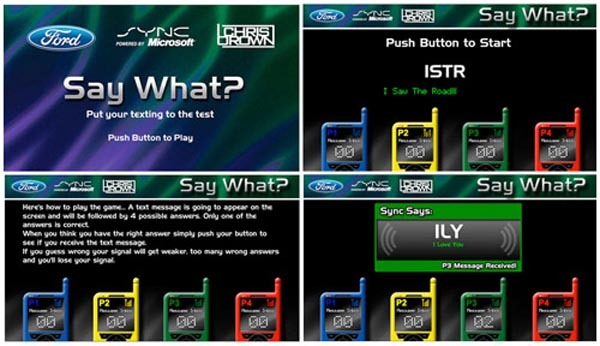 Created for use on a recent Chris Brown tour, this face-paced arcade style game was sponsored by Ford Motor and Microsoft to promote their Sync technology. The game is played by up to four players, when the game starts, a test message appears on the screen, and is followed by four possible answers. The first player to press their arcade button when the correct answer appears, gets a text message sent to their on-screen phone and receives a point. After the round is complete, the one with the highest score receives a Sync souvenir.